Matt graduated from Quinnipiac University with a Doctorate in Physical Therapy in 2017 after receiving a B.S. in Health Sciences in 2014. Matt’s clinical experiences included both outpatient orthopedic and acute care inpatient settings where he treated a variety of diagnoses. Matt’s passion is treating orthopedic and sports medicine patients, specifically post-surgical treatment and injury prevention. At Quinnipiac, Matt was a part of a research team that conducted a study that analyzed lower extremity kinematics of collegiate soccer and lacrosse athletes and their relationship with ACL injuries. 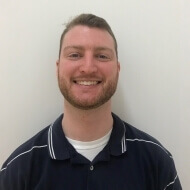 Matt utilizes a manual therapy approach in combination with therapeutic exercises to maximize patient outcomes. Matt is hoping to pursue various Manual Therapy certifications as well as become an Orthopedic Certified Specialist one day. Matt is a former collegiate soccer player of Quinnipiac. Outside of the clinic, Matt enjoys running, snowboarding, and playing all sports. He is a big fan of Boston sports teams as well as his favorite soccer team Manchester United.